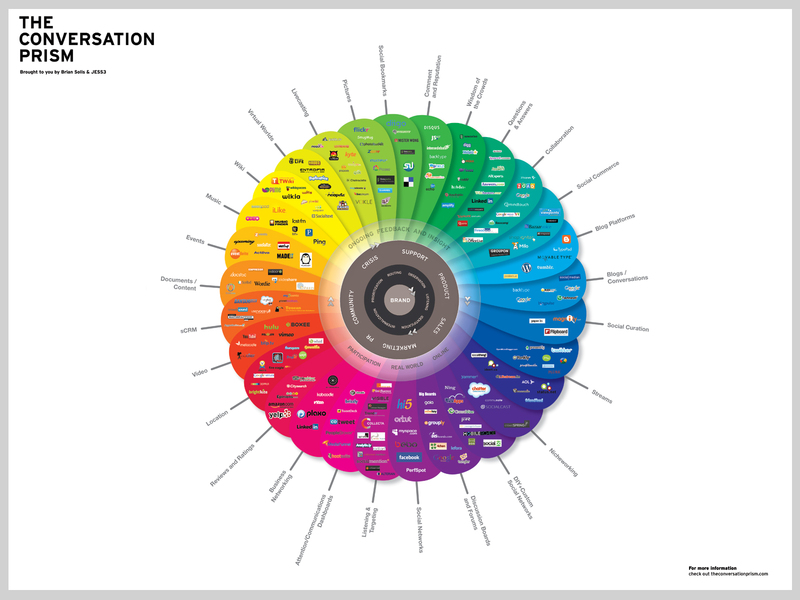 The Conversation Prism developed by Brain Solis of FutureWorks and Jesse Thomas of JESS3 gives you a complete view of the social media universe. This is the latest version: V 3.0, which introduces new groups and networks and also removes those networks that no longer exist. It is categorized and also organized by how people use each network. It will help you chart your online conversations between people and communities. Take note of what Social Media Marketing tools you are currently using in your marketing mix and use the Conversation Prism to see what you’re missing! Click here for Larger Version. … There are a lot of options aren’t there!? If you aren’t yet utilisng ‘Social Media’ in your business then have a read of my helpful blog titled ’7 TIPS to Kick-start Social Media in Your Business’; this blog post will help you to find out if social media marketing is going to work well for your business.